Macdonald Zuberec Ensslen Architects designed St Catharine’s eco-friendly parking garage, which features Haver & Boecker’s sustainable wire mesh. The Leadership in Energy & Environmental Design (LEED®) building certification system by the US Green Building Council is the American system of classification for sustainable buildings, which sets standards for environmentally friendly, resource-efficient and sustainable buildings. 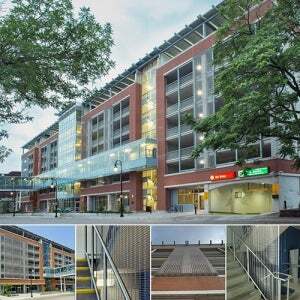 Parking garages that have been awarded LEED certification feature stainless-steel wire mesh façades from Haver & Boecker. A prime example of such an eco-friendly parking garage is located in the commercial centre of St. Catharine’s in Ontario, Canada. Macdonald Zuberec Ensslen Architects designed this LEED Silver-designated parking garage with 600 spaces for residents and city visitors. The high-recycled content within the project was important to the achievement of the LEED Certification. One part of this sustainability strategy is the architectural wire mesh from Haver & Boecker. The wire mesh façade benefits the energy balance of the car park, as the stainless steel mesh can be made from 90% of recycled materials. The open area of the wire mesh supports the natural ventilation inside the car park and reduces the required amount of lighting and ventilation equipment. The mesh also acts as an effective guard rail to prevent pedestrian falls. A total of 1,310m² in DOGLA-TRIO 1010 stainless-steel wire mesh was installed in this parking garage. Due to the strength of the material and its special weave structure, the resulting mesh is very robust but offers a high degree of transparency at the same time. 600m² of architectural wire mesh is used to clad the façade, whilst 470m² is used within the building as safety barriers. 240m² is installed inside the four stairwells of the parking garage, in elements of 25m x 2.40m. The extensive 30,000m² car park plays an important part in the city centre’s transformation, representing order to promote the economic life in the area. Additional retail units on the ground floor are available for rental space for future business. The car park won the Ontario Concrete Associations 2012 Sustainable Concrete Award.